How the Grinch Stole Christmas is a wonderful holiday book and we’ve made it into a fun birthday party theme for kids, tweens, and teens. 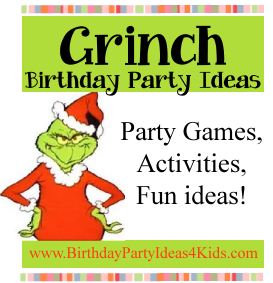 How the Grinch Stole Christmas party theme includes Grinch themed party games, activities and fun ideas for ages 1, 2, 3, 4, 5, 6, 7, 8, 9, 10, 11, 12, 13, 14, 15, 16, 17 years old. Holiday Lights Scavenger Hunt List – 50 fun items to find in neighborhood holiday light displays!